What exactly is the alpine descent or désalpe / alpabzug? This article explores the event’s history and where to see it. In Switzerland, we know the clock will soon strike autumn when processions of cows crowned with flowers and hung with huge clanging bells, descend from summer alpine pastures to their winter barns before the snows come. Led by cowherds and children dressed in embroidered traditional jackets and dresses, the colorfully bedecked dairy cows come by mountain trails to village streets, where people greet the colorful parades. 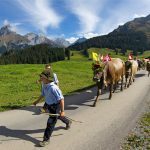 This end-of-summer tradition, known as the Désalpes in French, or Alpabzug in Swiss-German, has been taking place in Switzerland and other European countries since about 3000 BCE. It’s a festive time now, but wasn’t always. Turf wars over alpine grazing rights even tested the mettle of the young Swiss confederation at the battle of Morgarten in 1315. After a dispute over access to pastures, citizens from the canton of Schwyz raided the Habsburg-protected Einsiedeln Abbey. The Austrian Habsburgs invaded, having already had their eye on the nearby Gotthard Pass, the shortest route to Italy. The Swiss soldiers defeated the Austrians, earning the gratitude of generations of Swiss dairy cows. Today, festivities include more than pretty cows on parade. 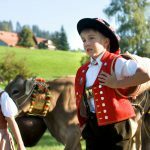 In some villages, visitors will hear alpenhorns and yodeling, and see traditional dancing, flag-throwing and men marching in unison to the tune of the cowbells around their necks. Regional crafts and foods are also offered, including, of course, cheeses made possible by those beautiful bovine ladies passing by that day. Summer milk from the high pastures is made into cheese both because the fresh grass gives it a preferred flavour as opposed to milk from winter silage, and because transporting all that milk down from the high pastures would be too expensive. The désalpe in Saint-Cergue, Vaud, is one of the most impressive in the country. Around 700 cows, goats, donkeys and dogs walk with their shepherds through the village centre. The usual colourful flowers adorn the cows, large bells hang around their necks and farmers wear traditional costumes. The spectacle includes whip cracking, flag swinging, alphorn demonstrations and of course cheese. Lots of it. The distinctive Eringer cows that spend the summer grazing on Alp Moiry descend every September via Grimentz, a pretty traditional Valaisan village in the Val d’Anniviers perched 1,570 metres up. These sturdy black cows produce a much sought after cheese, made distinctive by their diet of mountain grass and herbs. This cheese can be tasted at the festival as you watch the cows parade by. The désalpe in Charmey in the canton of Fribourg, not far from the hilltop town of Gruyère, is a highly popular event known for striking floral arrangements. The milk from these cows is used to make world famous Gruyère cheese. Charmey is also home to an excellent spa. The désalpes across the region are country-side spectacles that are difficult to grow tired of. Over the years some have changed, not only because things are apt to change but also because the towns and villages that have traditionally hosted them have realized that they offer opportunities to turn a few pennies by selling local produce and sometimes not such local produce. Nothing wrong with that, of course, the désalpes are a living tradition and need to be kept alive for future generations. Lately, though, some of them have become just a tad too commercial. The Crans-Montana désalpe is not one of these. The delight on the faces of farmers and townsfolk alike as the farmers and their livestock made their way through the town was genuine and palpable. These were friends and families getting together and anticipating time together in the winter after a tough summer working up in the alpine pastures…read more. These four are by no means the only désalpes in Suisse Romande. Most villages with a mountain backdrop and cows have one. For example the commune Blonay, below Les Pleiades near Vevey and Montreux also has one on 22 September 2018. In eastern Switzerland, cow and nature lovers are spoilt for choice. Here are four of the most popular events in the region. The video clips below will give you a taste of the bell bonging festivities. Far from the village you can hear the bells of the approaching herd. After four months in the mountains, the herder returns to the valley with his cows. For more information click here. The farmers market is run by 30 local and regional vendors selling homemade products such as bread, cheese, jams, dried meat, tea, wine, brandy, wool and wood products. In addition, there are drinks raclette, crepes, sausages, and other mountain delicacies. For more information click here. The Urnäsch event includes a farmers’ market with over 50 stalls offering local products. There is also live music, games for the children and a chance to meet the animals. For more information click here. As well as cows this event includes a market and cheese tasting and plenty of of activities for all ages. The event takes place at Küblis on 4 and 5 October and in Seewis on 6 and 7 October 2018. For more information click here.